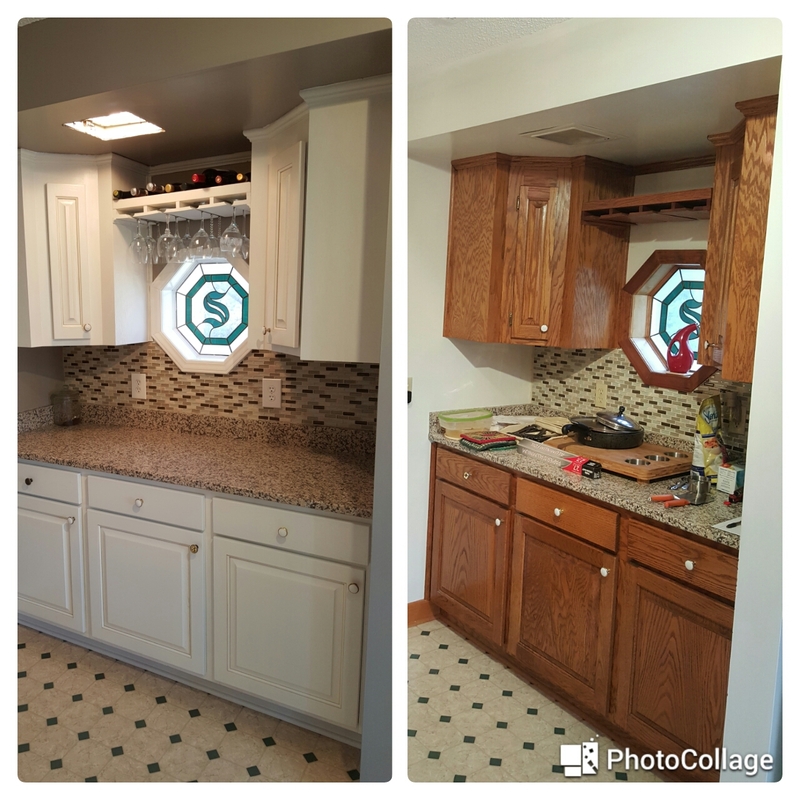 We completed this project recently and the kitchen cabinets refinished have a new light color that totally changes the whole look and feel of the space. Oak cabinets were very popular 15 years ago, however these days most consumers seem to want a cleaner fresher look. That’s were we come in. 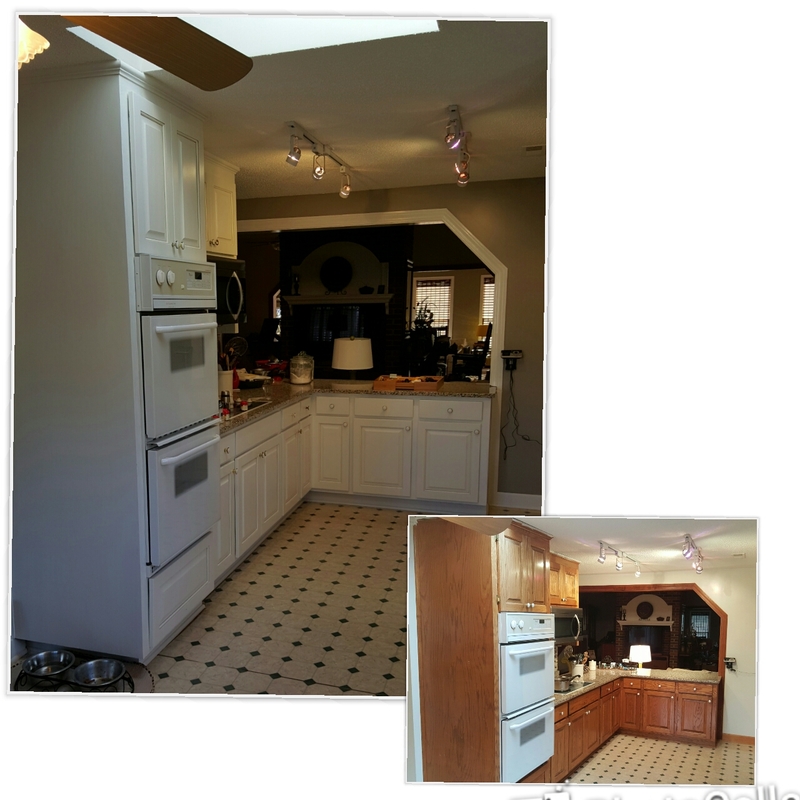 Below is the first before and after shot of this modest kitchen. The client chose a soft off white that tied in with the wall colors. As you may know oak is an open grain wood and in this instance we did not fill the grain pores. So once painted you still see some of the texture of the wood coming through. Other clients like for the wood grain to be filled which achieves a much smoother look, but that wasn’t the look we were aiming for in this case. We also removed the old outdated face mounted hinges and installed hidden soft close hinges. This takes the old bras color hinges off the face of the cabinets which gave it an dated look. While it’s hard to see in the pictures we also added a soft oyster gray glaze pinstripe on the doors around the grooves. Refinishing Kitchen Cabinets is an affordable way to dramatically improve the appearance of a kitchen. Additionally, it is significantly less expensive than replacing the cabinets. If done by competent professionals the finish, when redone, is often much better and more durable than the finish originally applied by the cabinet manufacturer. When choosing a refinishing company ensure they use high quality lacquers and paints such as the ones offered by Gemini. Most companies that refinish cabinets can also make modifications to existing cabinets, such as additional drawers, pull out shelves, etc. Add in a few modifications here and there and you end up with a much improved kitchen that you fall back in love with.